I must be some kind of glutton for punishment. By 1989 there were a diverse selection of Star Trek games available for various consoles and home computers, including the first title based on Star Trek: The Next Generation; an MS-DOS adventure game called The Transinium Challenge where you play Commander Riker in charge of a team investigating terrorist attacks in the Aquila system. It was one of the first games to showcase the format that would go on to characterize many of the Star Trek games I remember, such as plotting a course in stellar cartography and leading an away team comprised of party members of your choosing, each of whom has their own unique skillsets. The Transinium Challenge was also interesting because of its emphasis on diplomacy and puzzle-solving instead of space tactics, and its original extraterrestrial culture, which draws heavy influence from Celtic mythology and folklore. 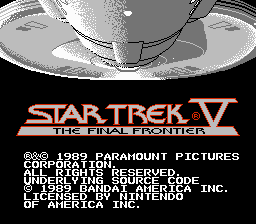 But no, I had to pick a game for the NES based on Star Trek V: The Final Frontier. To be fair, it's not strictly a red flag when you get a game based on a mediocre, unsuccessful movie. Sometimes passionate and tenacious video games based on licenses can rise above and beyond their source material to become well-loved and effective in their own right in spite of their roots: Gremlins 2: The New Batch for the NES and The Chronicles of Riddick: Escape from Butcher Bay for the XBOX are both considered classics, while the movies they were based on...aren't. Simply being Star Trek V: The Final Frontier does not doom this game from the outset. If anything, Star Trek V should work *better* as a video game freed from the constraints of the linear narrative structure of the Hollywood blockbuster. What is somewhat concerning, however, is the fact this game was never actually released and is only available as a reproduction cart or through particularly creative means. Also, that it was designed by Bandai Games. That name may not ring a bell for a lot of you, but it had me both completely astonished and incredibly apprehensive, because this is the exact same team responsible for that godawful Dirty Pair: Project E.D.E.N. game for the Famicom Disk System. And yet even so, this was *still* easier to find and get actually running than an old DOS game would have been. I've reached the age where actually having my video games *work* out-of-the-box is a requirement for me to invest my time, so this was kind of a deciding factor for me. So, having something of a baseline set of expectations for what I was in for, I braced myself for the worst and fired up Star Trek V: The Final Frontier to see what this crew came up when given a far less coherent film to adapt. Well, it's pretty. Parts of it. Well, the good thing is that the overall production values are much higher this time. The graphics and sound, while nothing really to write home about, are actually somewhat appealing and have a measure of artistry about them that Project E.D.E.N. utterly lacked. I would complain about this and get confused as to why a Japanese developer has clearly put more effort into a game based on a Western property than a comparatively major local one (or, for that matter, why an NES game looks and sounds better than an FDS one), but honestly I'm just happy the thing isn't entirely repulsive to look at and listen to: There's some decent 8-bit renditions of the music from the movie (including *that* piece), and the sprite art is relatively detailed and colourful for the time. Although I say that referring primarily to the backgrounds-While the renditions of Kirk and co. we seen in the cutscenes are detailed enough, they only bothered to design one overworld sprite. This means that, whether you're playing Sulu in the early levels or Kirk in the later ones...Your character looks identical either way. Just like last time, there are two primary gameplay modes: The first is your standard sidescroller-shooter type action, which is serviceable if a bit boring, because now we don't even have any platforming obstacles or hovercar powerups to break up the monotony of walking to the right blasting things. 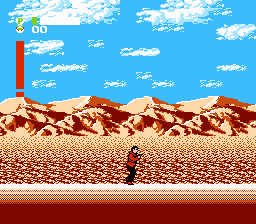 Which is literally what you do, as the levels are all completely flat and utterly devoid of visual interest save for the backgrounds (well, I guess Nimbus III *is* a desert planet, after all). 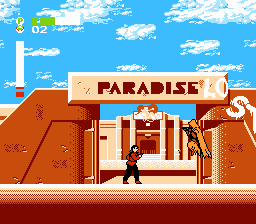 As befitting the movie this game is based on, the first level consists of taking Sulu to retake the Paradise cantina from enemy forces that look suspiciously like Jawas. One does sort of expect to see Luke Sywalker floating by in the background on a landspeeder. 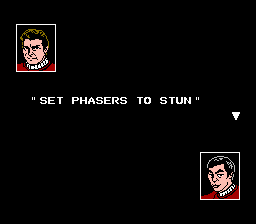 Your health and Phaser energy both have their own meters, and the higher your phaser energy the more powerful your shots become and the longer the range you get with them. 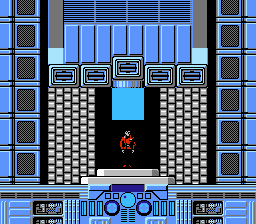 And you're going to need every bar of that, because the enemies, even on the first level, take forever to take down and, just like in Project E.D.E.N., they spawn out of nothingness right in front of you giving you no time to react, so you'll never hit them before they hit you. Get used to seeing this screen a lot. through an asteroid field to reach Sha Ka Ree all the while trying to dodge a Klingon Bird-of-Prey. There's a radar and a little ship's operations sub-screen where you can monitor things like your shields, power and damage reports. Basic stuff you'd expect to see in a Star Trek game (and done considerably better in other Star Trek games), but it's nice to have anyway. Since this is NES, obviously there's no fancy joystick controls, it's just point and go with the control pad and interact with the A and B buttons. Which I actually like a lot: I tend to prefer elegance and simplicity in my control schemes as opposed to complexity for the sake of complexity, so sue me. I quite like the sprite art for the interior scenes. It's pretty good for the time and place. These kind of games are always hard to review because, since they're unfinished prototypes, they're not necessarily indicative of what the final product could have been. But I'll be honest. I wouldn't have held hugely high hopes for this one simply looking at its pedigree. It improves some things from Dirty Pair: Project E.D.E.N., yes, albeit just barely. but let's actually think about that for a minute: Project E.D.E.N. was designed for the Famicom Disk System, which is a technically superior console. What does it honestly say about the job this team did on that game that anything on the NES could be seen as an improvement? I, for one, am pretty incensed that Bandai slagged off Dirty Pair (especially ironic given that Bandai Games' parent company now *owns* Sunrise) and did a better job on *Star Trek V* of all things, even if in practice all it amounts to is half-assing it a little bit less. And then there's the fact that Project E.D.E.N. didn't actually have much more content than this game does in the first place: In other words, Bandai Games is telling us a *full retail game* on an *advanced console peripheral* is worth roughly about as much as an unfinished prototype you can find distributed on the Internet for free if you look hard enough. But on the other hand, this may well be the definitive Star Trek V: The Final Frontier game simply because of that: Just like the movie it's based on, this game is a half-assed rush-job with with tragically unfulfilled potential cobbled together to keep tapping the lucrative Star Trek brand with no regard to how much it insults the audience's intelligence in the process and how badly that reflects on the creators. Prophets, that's depressing. I need to go do something fun now. I have a certain affection for the Star Trek V DOS game myself. I think I may have even beaten it once, though the whole "you get one set of photon torpedoes and one life-bar for the whole game including the levels which are in-story a 'simulation' with no refills or power-ups' thing makes that seem unlikely. Thanks for the fun write-up on this -- I wasn't even aware it existed. I do have a lot of love for NES games. If this were available as an actual cartridge I have to admit I would pick it up. I do have a ST: OS game for the NES (the 25th Anniversary one, IIRC) and a TNG game. Hopefully you'll tackle those, too. On a very very tangential side note -- Bandai also recently produced 3 different Star Trek deck building card games (2 different TNG versions, and 1 TOS) and they're all a lot of fun. FYI for all the gaming geeks out there. And look at me talking. It's not like I haven't tracked down a complete copy of the Dirty Pair game (*plus* its manga strategy guide). 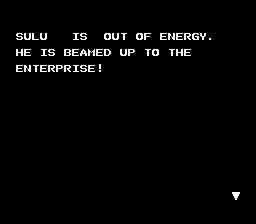 The Star Trek: The Next Generation game for the NES (and Game Boy, actually) is a definite. So's Star Trek 25th Anniversary, but I played the original PC and Macintosh version of that game instead of the console one. Both are incredibly important to me as they were the first proper Star Trek games I owned. I'm not really a gamer but this was fun to hear about. Though it seems and odd choice based on the story, but I guess that shows any story of a similar ilk that has at least enough verve could be turned into a pretty good game. It is funny isn't that a lot of the first scene does look like Tatooine with Jawas coming at you - I had a look at a YouTube video of someone doing gameplay, and the warp effect was quite lovely.